This page is a reference for information about Ponderosa Pine and their design uses. We have also provided links to local design codes and guidelines. If you have any links or topics you think should be added to the page to make it more useful to you and your design staff, please let us know by email at mail@spokaneponderosa.com. Storm water absorption of Ponderosa Pine alone in a study of public trees saves the City of Spokane $210,149 per year in mitigation through rain interception and storage. 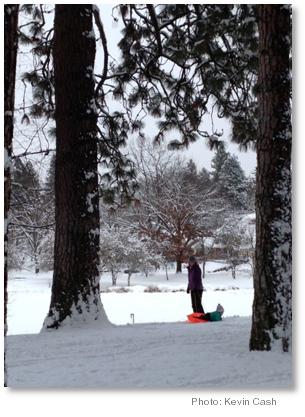 Ponderosa Pine are a well loved feature in, and around, many of the public parks and open spaces in Spokane County. Many areas have community groups that take personal ownership in the pine trees in their neighborhood parks (e.g. Manito Park in Spokane). These groups are very defensive of their trees. The Ponderosa Pine is synonymous with the region and its native beauty. 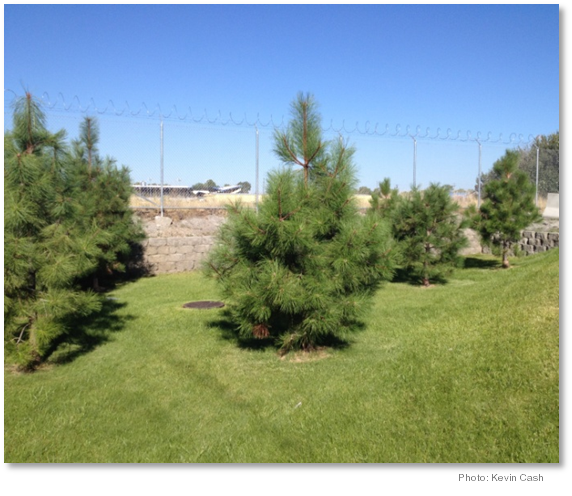 Specify Pinus ponderosa var. ponderosa, Douglas ex C. Lawson - (North Plateau Ponderosa Pine). Specify plant stock grown in the Inland Northwest from local seed. Specify and verify that the root ball diameter and root structure quality meet American Standards for Nursery Stock. Specify that at no time will the root ball be allowed to dry out after digging by the grower. Require a written watering schedule for stockpiled trees be included as part of the submittal package from the Contractor (already required for projects at WSU). If you’re not 100% certain that wind won’t be an issue specify staking. Soil amendments can be specified for Ponderosa. Fertilizer, when used, should be added to the surface, not directly in the hole. Supplemental watering is a must for Ponderosa larger than seedling plug size. Supplemental watering should be for at least two years. Professional arborists suggest a minimum of three years and an additional year for every two inches of caliper.